Here’s what’s up in the world of TV for Monday, November 21. All times are Eastern. 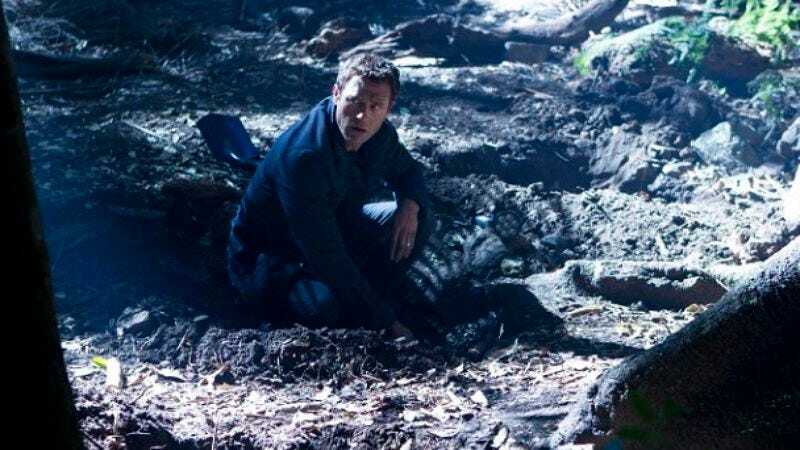 Terra Nova (Fox, 8 p.m.): It’s hard to say that things have been “heating up” on this show, when things remain so resolutely boring, but theoretically, things have been heating up, as we’ve learned more and more each week about how Taylor’s not the benevolent leader he seems to be. And if there’s an episode where this show is going to kick into high gear, it’ll likely be this one, wherein an old murder is uncovered, and Taylor seems to be the only suspect. More likely than not, it will be terrible, but what else are you going to do tonight? Stay home. Rowan Kaiser will bring the popcorn. How I Met Your Mother (CBS, 8 p.m.): It appears that Ted and Barney are finally adopting a baby together, and it’s hard to say that we haven’t seen this one coming for quite a while. Donna Bowman’s out this week, but Katherine Miller will step in to see what wacky fatherhood scrapes those two get into. 2 Broke Girls (CBS, 8:30 p.m.): We all know that Todd VanDerWerff can’t be trusted on this show, because he’s swayed by attractive women or the sound of a studio audience laughing or… something. But tonight’s episode is Christmas-themed, so somebody needs to shut him up before he gives it an A+. Bored To Death (HBO, 9 p.m.): Hey, Isla Fisher’s in tonight’s episode! We like Isla Fisher, and she was one of the stars of the most accurate romantic comedy about political campaigns ever made, Definitely Maybe! David Sims will watch and hope her red-headed feistiness perks up this one. House (Fox, 9 p.m.): The episode summary for this one lists one of the guest stars as “an angst-ridden 14-year-old girl.” Is there any other kind of 14-year-old girl? Are there 14-year-old girls who are all sunlight and lollipops? Zack Handlen has his doubts that such a thing is even possible. Enlightened (HBO, 9:30 p.m.): Look. We’ve come to really like this show, but that doesn’t mean we can’t still make fun of the ridiculously low stakes in any given episode. Tonight’s plot catalyst: a bad dream. A bad dream! Ooooooh! Erik Adams once had a bad dream he had to cover Whitney. Castle (ABC, 10 p.m.): “A sniper goes on a murder rampage,” reads the episode summary, which makes us wonder if there’s any other kind of rampage a sniper could go on. Phil Nugent’s off doing other things this week, so Carrie Raisler sees if Castle can catch said sniper with wisecracks and quirked eyebrows. Scrubs (11 a.m.): Myles McNutt had forgotten that the two episodes he’s covering this week are, essentially, a two-parter, as the show introduces Christa Miller as Dr. Cox’s ex-wife, Jordan. And then Christa Miller would play this part for years to come. And we would love her for it. Justice League (1 p.m.): Lex Luthor decides to make a team of supervillains—like you do—and comes up with the oh-so-creative name of “Injustice League” to cover said team of supervillains. Oliver Sava thinks he could come up with a better name for a team of baddies. Suggestions? Dancing With The Stars (ABC, 8 p.m.): If you’re going to pay attention to this show for any reason—and why would you?—this is the week to do so, as we’re into the finals. If you’re curious, the final three are a Kardashian, an Army veteran, and Ricki Lake. We’ll cheer for the veteran, thank you very much. The Layover (Travel, 9 p.m.): Everybody's favorite reality host Anthony Bourdain has a new show where he visits popular travel hubs and shows viewers fun things to do if they're ever stuck there for a long layover. We're hoping he ends up in Chicago at some point and stops by the A.V. Club offices. You Deserve It (ABC, 9 p.m.): Emily Yoshida covers the first episode of this new game show, in which contestants answer trivia questions in an attempt to win money for other people. And why do they do that? Well, pretend you’re in the studio audience and chant the title loudly right now. Hawaii Five-0 (CBS, 10 p.m.): Terry O’Quinn’s been on the show this season, and it might as well be retitled, Old Guys Doing Awesome Stuff, which is sort of the CBS ethos, if you will. Anyway, if you’ve been needing a “Terry O’Quinn in Hawaii” fix, here’s something to tide you over. Ratatouille (Disney, 8:30 p.m.): Is this sweetly charming tale of a rat who wants to cook the best Pixar movie? We don’t know for certain, but it’s definitely gotta be in the top four or five, right? There’s nothing on broadcast tonight, so you might as well watch it again to be sure. The Ghost Writer (TMC, 10 p.m.): Or if you haven’t seen this moody thriller, directed by Roman Polanski and starring Ewan McGregor and Pierce Brosnan, it’s another great option if you’re looking for something to check out. It was one of the most underrated movies of last year. Monday Night Football: Chiefs at Patriots (NBC, 8:30 p.m.): We mean no offense to Kansas City or its many certainly excellent sports fans, but we always forget the Kansas City Chiefs even exist. In fact, we haven’t really thought much about them since the heyday of Christian Okoye. So there’s that. Family Guy (Sunday): We have no idea what Kevin McFarland thought of this Thanksgiving-themed episode, since we’re writing this several hours before the episode airs and we don’t possess a time machine, but we’re guessing he loved it because who doesn’t love turkey?